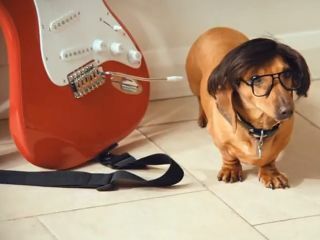 The thick-framed glasses, the Fiesta Red Fender Stratocaster... instantly recognisable signifiers of arguably the most important and influential British guitarist of all time, the legendary Hank Marvin. Of course, here in the UK, The Shadows' guitar genius is also inextricably linked to hunger pangs thanks to Hank Marvin being interchangeable with 'starving' both in cockney rhyming slang and common parlance across the country. Meat company Mattessons decided to take this wordplay and run with it in the advert above, with Fender GBI supplying the Stratocasters. 52 years on, Apache still sounds pretty damn incredible. To gain an insight into one of the key elements of the Hank Marvin sound, guitarist spoke exclusively to Hank himself as part of a special tape delay feature in Guitarist magazine issue 357, on sale 29 June. Don't miss it!